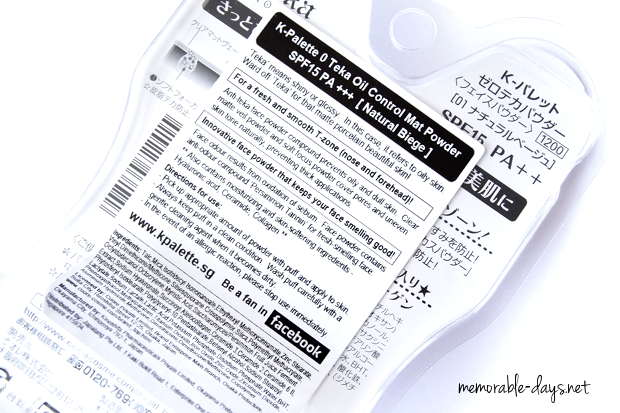 Review: K-PALETTE - Zero Teka Oil Control Mat Powder | Memorable Days : Beauty Blog - Korean Beauty, European, American Product Reviews. 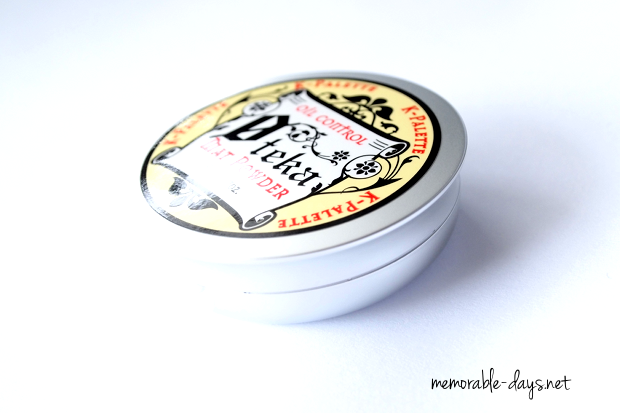 I've been looking for a soft powder for a long time which I can easily carry in my make up bag. I didn't want to buy an expensive one, I didn't want to have a lose powder, I didn't want to have a cakey effect after application. However, it does need to control my oil. I'm glad that I finally found one which meets the above standards. 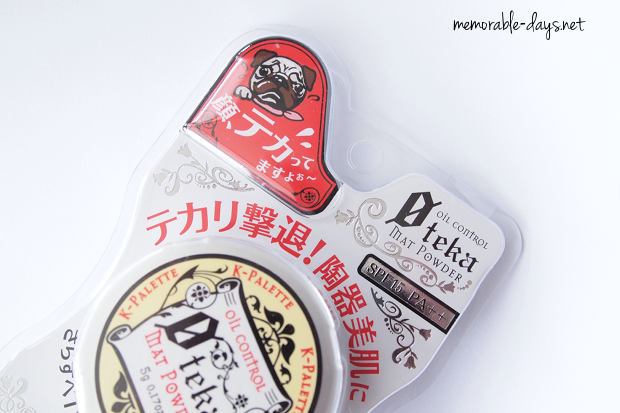 This product is called Zero Teka Oil Control Mat Powder which is from the brand K-Palette. I found it while I was browsing through Beautycarousel.com. I will be reviewing this product today. It's a light-weight soft powder with SPF15 PA ++ for UV protection and it helps to cover pores, uneven skin tone and absorb excessive sebum to control shine. The unique powder mix is formulated to diffuse the reflection of light to give you that mat, ceramic complexion all day long. It contains moisturizing ingredients, hyaluronic acid and collagen to keep the skin supple. The powder also contains innovative anti-odour compound ‘Persimmon Tannin' for a fresh-smelling face. A puff is included as you can see below. It's quite small though, so it might be hard to use for people with thick fingers and large hands. However, the size is just right for me since my fingers are totally the opposite from what I just said. You can purchase this at beautycarousel.com (link to product) and they are selling it for $15.69. 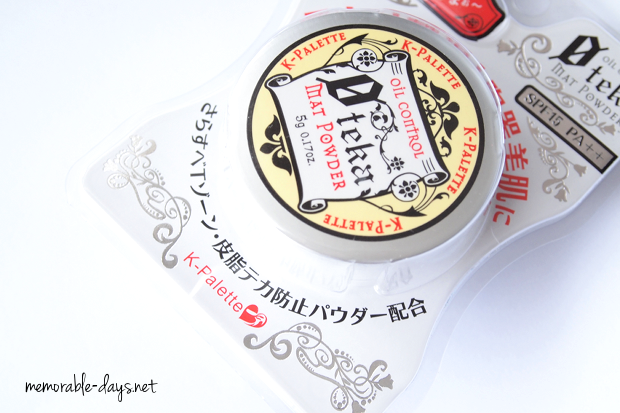 Go here if you're looking for other K-Palette products, they even sell the popular 1-tattoo eyeliner! Don't forget to use my coupon code BCElisa to get 10% OFF of your whole purchase! Also, they are shipping their products worldwide! (Link to their assortment). Lol there is a sad dog on the packaging xD, I'm not sure what the Japanese words mean though.. There are English descriptions at the back so you don't need to worry about that. 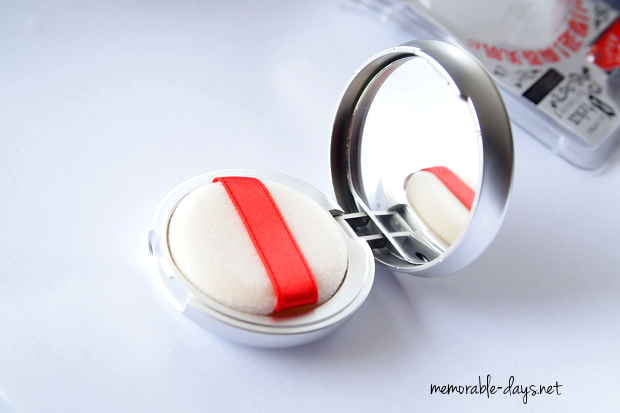 - Pick up an appropriate amount of powder with puff and apply to skin. - Always keep puff in a clean condition. Wash puff carefully with a gentle cleansing agent when it becomes dirty. - In the event of an allergic reaction, stop using it immediately! Would I recommend it? YES! 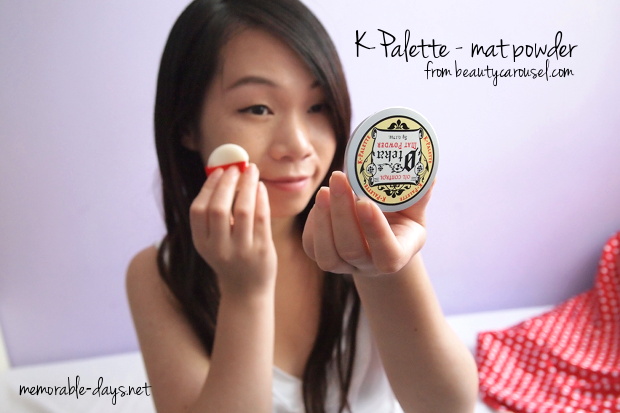 This mat powder works! It makes my skin looks mat as you can see below. 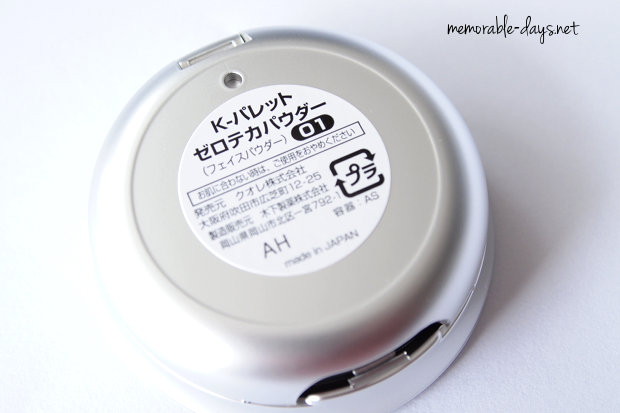 My T-zone is extremely oily during the evening and I always need something to keep it mat. This mat powder is a great alternative for that. It doesn't dry out my skin and the natural beige color suits my skin pretty well. (My skin tone is NC20. This product is not suitable for people with a dark skintone.) I don't smell a scent to it, which I like, since I totally don't like scented make up. 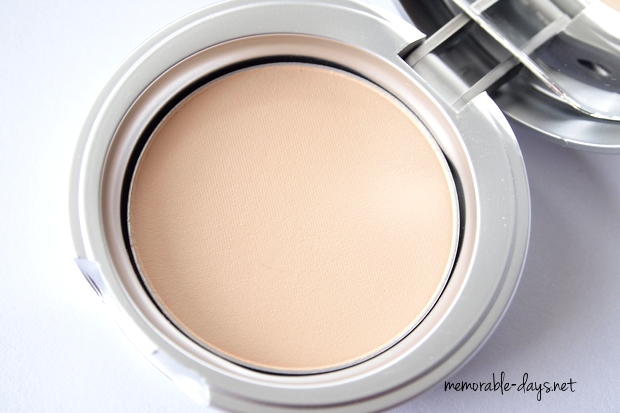 It has a little bit of coverage as well, just to create an even skintone. Do keep in mind that you need to clean the puff after usage, otherwise the bacteria will stack up on the puff. Would you like to purchase this product as well? Go to www.beautycarousel.com and don't forget to use my code: BCElisa to get 10% OFF!! 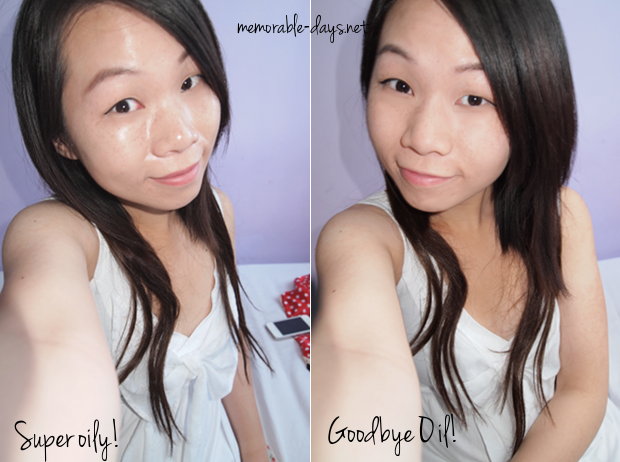 I took both pictures with flash so that my oily face is more visible.